What a wonderful photo. 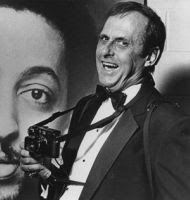 Dallas society photographer Andy Hanson died on October 22. He wasn't just a society photographer, although that's how many of us in the media, and who went to parties, knew him. He shot anyone who was anyone who happened to come through Dallas during the past 40 years -- movie stars, jazz greats, politicians you name it. He worked for a long time at the long-defunct Dallas Times Herald. His photography was top notch -- during the years he had photo restrospectives, including one a few years ago at Photographic Archives, a respected photo lab that skilled photographers sill use. I met him 15 years ago when I was doing PR for the Dallas Opera. Then, after I was hired at PaperCity, he introduced me to all the people I needed to know in Dallas. I remember my editor was so frustrated by Andy's photographs -- he had this "magic" technique that rendered the prints almost impossible to scan without looking muddy. Andy, who taped a cruddy piece of white cardboard around his flash to soften the glare, created some of the most flattering party pictures around. Too, he used some other techniques that he never revealed, to produce a golden glow. Socialites loved him for making them look beautiful, and often ordered photos from him. Magazines just found it vexing. We sure do miss him, though.